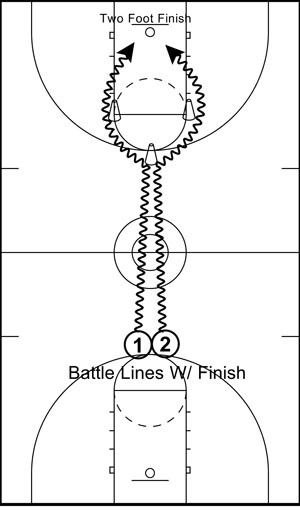 The battle lines drill series is a great series to incorporate into your in season practices and out of season training. This drill series shows great carry over into the game from the practice setting. 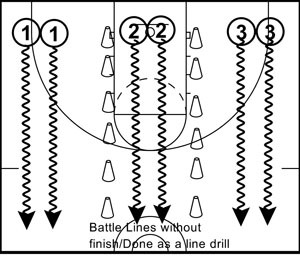 Battle lines is also great to incorporate into a camp setting because you can do this drill with high numbers of players and limited space. Have players partner up and have each player with a basketball. Set up a cone at the top of the key and one at each elbow. Have players start shoulder to shoulder at the opposite top of the key. The players both start by dribbling toward the opposite basket while also pushing their shoulder into the other player. At the top of the key they split and must dribble outside the elbow on their respective sides and then go in for a finish. When doing this drill it is critical that both players execute a two foot jump stop finish. I also make players execute a shot fake to ensure that they have good balance and don't run into each other. This drill can also be done without the finish, you can have the players just battle lines from the baseline to half court to maximize repetitions. Both players could execute a pull-up jumper or kick to a shooter in the corner on their side. Great drill! What about rebound battle drills? Thanks. Good drills. I use a game similar called tag. Each player dribbles and tries to steal ball from each other, just knocking it out of control is enough to win than go to another and that will be 3 on 3. Same game you get winner in five minutes. Great drill. Youth need skills as much as knowledge. Try "Tag". 2 teams try to go from one baseline to the other. All are dribbling. Touch your opponent "freezes" him. Touching your frozen teammate unfreezes him. Lose control and restart from the original baseline. First team to cross the opposite baseline "Wins" ! This simple drill is better than the "coach with a kick pad/cushion" drill. Do you have a drill that improves kids ability to complete shots after contact? I have a couple of taller kids who seem to lose focus and do not complete shots after they get jostled under the basket. Modify the drills to create the situation you want them to get better at.